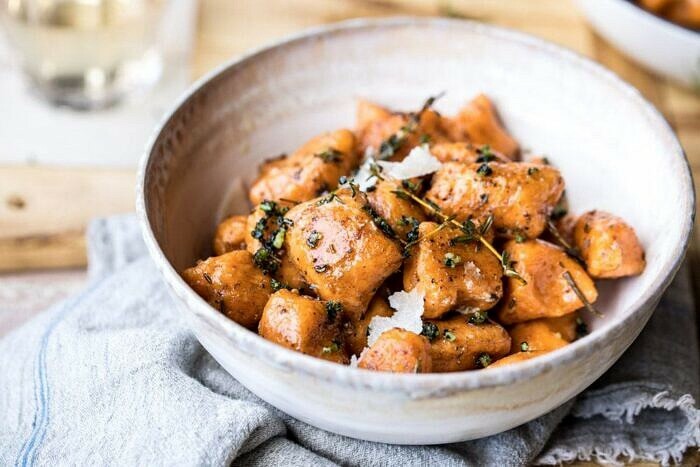 Sweet Potato Gnocchi with Herbed White Wine Pan Sauce. 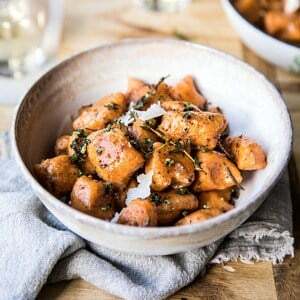 Sweet Potato Gnocchi with Herbed White Wine Pan Sauce. 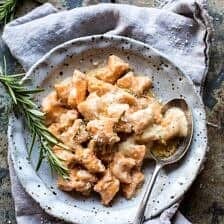 Making gnocchi at home is easy with this 4 ingredient recipe using mashed sweet potato, flour, eggs, and ricotta cheese. It’s light, pillowy, and tossed in a delicious white wine and herb butter sauce. 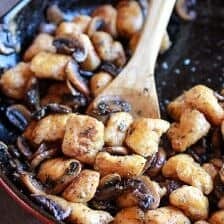 This gnocchi is the perfect way to spend a relaxing fall night in the kitchen with family and friends. On days when the weather is cold and dreary, the only thing I want to do is spend my time cooking away in the kitchen. This past week has been the dreariest, but I’m secretly loving every minute. One, the grey clouds are casting the most perfect light in the studio barn, and pretty light makes me the happiest. Two, I’ve had so much cooking and baking to do this week, and this cozy weather makes it perfect for staying inside and testing new recipes. One of my favorites of the week? Hands down this soft, pillowy, and ricotta cheese filled gnocchi. Which is very much inspired by these fall days. I haven’t made gnocchi in the longest time. When I realized this, I knew it was time roll up my selves and get to rolling out some fresh dough. I’ve made both pumpkin and potato gnocchi, but sweet potato gnocchi is by far my favorite. I just love sweet potatoes and especially sweet potatoes with ricotta…and especially when tossed in a buttery sauce. It really is the perfect combo. If you’ve never made gnocchi at home before, don’t worry it’s not hard. It can actually be a really fun project, especially if you invite friends or family over to help! To start, you’ll need to roast and mash your sweet potatoes. I love doing this in the oven, but if you have an instant pot, you can pressure cook the potatoes until they are fork tender (about 15 minutes on high pressure), peel away the skins, and then mash. Both the oven and the instant pot work great, so just use your preferred method. Once you have the sweet potatoes mashed, it’s time to make the gnocchi. All you need is flour, an egg, and fresh ricotta cheese. Mix everything until a dough forms. Then roll the dough out into ropes and cut into cute little balls of gnocchi. Simple as that. Don’t stress about making each gnocchi perfect. The beauty of gnocchi is that each little puffed ball is different and cute in its own unique way. And no matter what, they’re going to be delicious. Sounds so cheesy, but it’s also very true. Before you boil the gnocchi, make the sauce. It’s a mix up of golden brown butter, white wine, and lots of fresh herbs to give the sauce a really good flavor. Boil the gnocchi and then drop it right into the sauce. Toss to combine, and then serve the gnocchi topped with manchego cheese. The gnocchi is light, cheesy, and hinted with flavors of sweet potato, while the sauce is buttery and savory. Together they make the most perfect bowl of homemade gnocchi. I know you guys will love it! And with that, I think we should all head home tonight and make it a special Thursday night full of gnocchi, wine, and maybe a good Halloween movie too. Sounds pretty good to me. 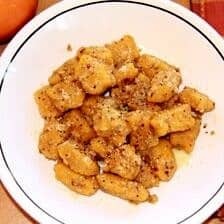 If you make this sweet potato gnocchi, please be sure to leave a comment and/or give this recipe a rating! Above all, I love to hear from you guys and always do my best to respond to each and every comment. And of course, if you do make this recipe, don’t forget to also tag me on Instagram! Looking through the photos of recipes you all have made is my favorite! Making gnocchi at home is easy with this 4 ingredient recipe. It's light, pillowy, and tossed in a delicious white wine and herb butter sauce. It's the perfect way to spend a relaxing fall night at home. 3. In a large bowl, mix together the sweet potatoes, ricotta, egg, salt, and flour. Stir the mixture until just combined. If the dough seems wet, add a tablespoon of flour at a time, until it can be formed into a ball. The dough should be sticky. 4. Generously flour a clean counter and scrape the dough out onto it. Cut the dough into four equal pieces. 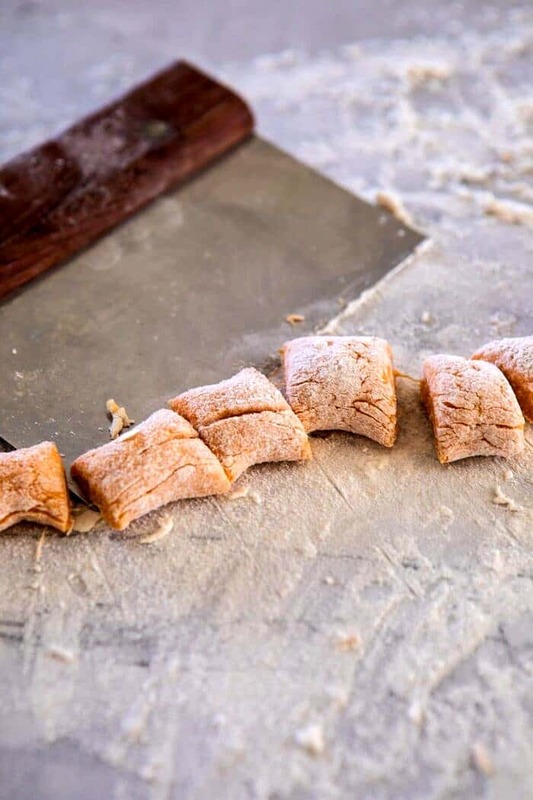 Working with one piece of dough at a time, roll the dough into a rope about 1 inch thick and cut into bite size pieces. 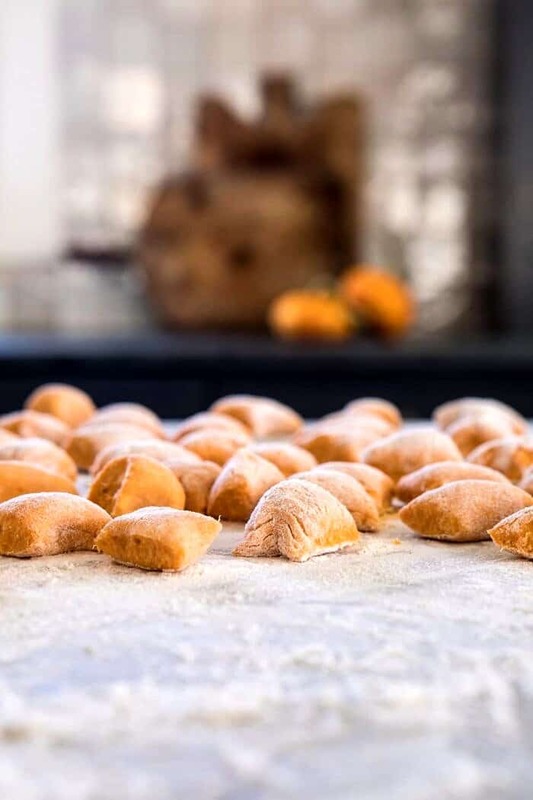 Repeat this process with the other pieces of dough and place the gnocchi on a baking sheet that has been dusted with flour. At this point, the gnocchi can be kept covered in the fridge for up to 1 day, and then boiled just before you are ready to eat. Or boiled right away. 5. To make the sauce. Heat the butter and shallot in a large skillet over medium-high heat and cook until the shallot is fragrant and the butter begins to brown, about 3-5 minutes. Stir in the thyme and rosemary and cook 1 minute. Add the wine and cayenne, and season with salt and pepper. Simmer the sauce for 3-5 minutes. Keep warm over low heat. 6. Bring a large pot of salted water to a boil. Boil the gnocchi until they float to the top and are cooked through, about 3-4 minutes. Remove the gnocchi using a slotted spoon or spider strainer and drop right into the sauce, gently tossing to combine. If the sauce thickens up, add a splash of the gnocchi cooking water to thin it a bit. 7. Divide the gnocchi among bowls. Top with manchego. EAT! I see I can store the gnocchi for 1 day before use, but could I also pre make the sauce and then reheat it the next day as well? Would that work? I want to make this for thanksgiving but stove availability is limited during the holiday so would need to be quick about it! Thanks for the info! Definitely making this! Unfortunately, we do not get orange sweet potatoes in New Delhi. Can we make this with normal white sweet potatoes? Yes, that would work fine! I hope you love this Sheenam! I hope you try this! Thank you! Yummm. This looks amazing! All of my favorite fall things. Tieghan, do you think this would work with gluten-free flour? Thank you!! This looks SO GOOD. 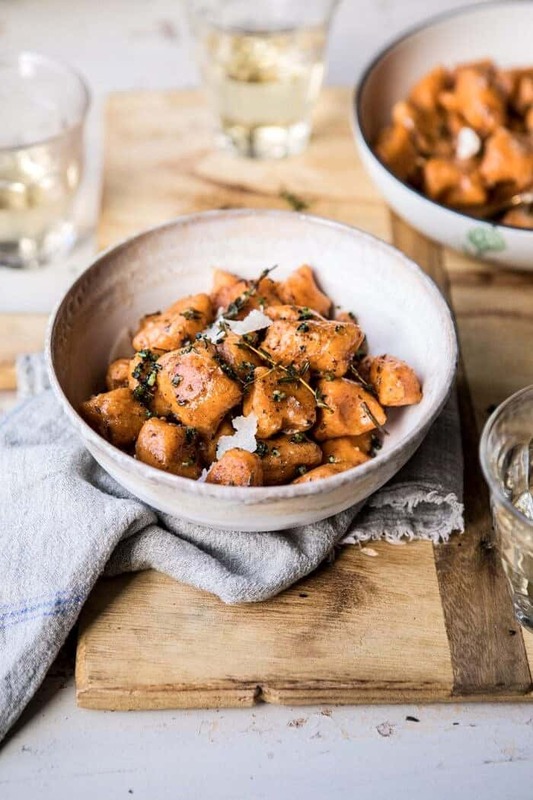 I’ve made your base sweet potato gnocchi recipe before and always love them. But I have some trouble getting them to brown up in the pan after taking them out of the water. Yours always looks so yummy and crispy and perfect. Do you have any tips? Should I be doing them in batches/am I likely just overcrowding the pan? I always feel a little bit like I’m just steaming them more because they’re wet from being pulled out of the water. This looks DIVINE. Utterly divine. 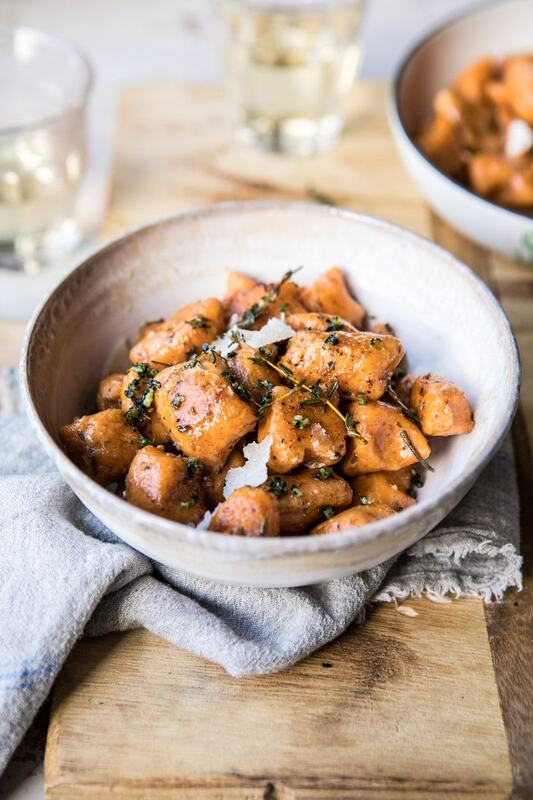 I’m no stranger to sweet potato gnocchi, but that herbed wine sauce….yum! Will definitely be making this soon. Thanks for another fabulous looking recipe!! I hope you love this Tanvee! Thank you so much! Fresh gnocchi is just magical, isn’t it?! It’s chilly here too… I’d love to cozy up with a bowl of this. YES! I hope you try this Natasha! Thank you! Any advice on if these freeze well if I were to make a double batch? YUM!! Knocking it out of the park on this one my friend!! I love cooking when the weather is cold and dreary! This looks like the best comforting fall meal! Yum. Me too! I hope you try this Christina! Thank you! This sounds perfect for the weather we have been experiencing here. My family tends to want protein with pasta dishes (I know… they are nuts! ;)) Do you have any recommendations on a protein to go along with these gnocchi? Hi, can i use purple sweet potatoes with this recipe as well? If so, would i have to change anything to the recipe for the dryness? The purple color would look amazing! Hi Tiffany! Yes, that would work great! I hope you love this recipe! This seems like the perfect recipe to make with the leftover potato from the sweet potato turkey chipotle skins. Cant wait to try it! Hi, i was wondering if i could use purple sweet potatoes for this recipe? If so, would i have to change or add something to the recipe, because of the purple potatoes dryness? I think the purple color would be amazing! Hi, i was wondering if i could use purple sweet potatoes for this recipe? If so, would i have to change or add something to the recipe for the dryness of the purple sweet potatoes? I think the purple color would look so amazing! 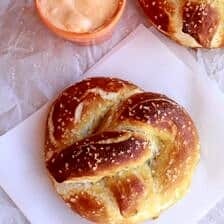 Can I use whole wheat flour? Or any other flour substitute ? Wow!!!! This looks so tasty and beautiful! Having a friend over for dinner tonight and was stressing what to make. Voila!!!! Here’s my answer!! Can’t wait to make it. I am so glad you picked this! I hope it turns out amazing for you Danielle! Thank you! I always love seeing your recipes in my inbox. I’m also a big fan of your favorite things posts. I tried this last night and I definitely did something wrong. My dough started disintegrating in the water. I worked the flour, egg salt and ricotta together and it was a little wet so I added another little shake of flour. Do you think I might’ve overworked it? It didn’t seem to want to cling together. The dough itself tasted fine, the structure just seemed off. Made this for dinner tonight, and it was absolutely phenomenal! I am so happy to hear that! Thank you Claudia! I made this for my mom yesterday. She took a small helping, thinking she probably wouldn’t like it. She’s not a huge sweet potato fan, but she was humoring me and didn’t want to hurt my feelings if she couldn’t finish a big bowl of it. She finished her first bowl and went back for seconds! All afternoon, she was gushing about how much she loved this recipe!! Thanks so much for sharing it! I adore all your recipes, but your fall ones are always my favorites!! I am so happy to hear that! Thank you so much Kate! Gnocchi is my favorite and I love the white wine sauce! We made these on Wednesday and they were perfect, pillowy soft gems of tastiness. As per usual, I failed to remember some ingredients, so we just made a buttery, garlicky, white wine sauce. Obviously that wasn’t a poor decision. Thanks for the tastiness! I am so glad you enjoyed these Shelby! Thank you! I made this last night and my husband said it was the best meal we’ve ever had! Then he had the worst acid reflux attack ever (which I interpret as a testament to how rich and delicious this dish is), so, if you please, warn your loved ones with GERD to take a bottle of TUMS before diving in. And yes, I will be eating all the leftovers and I’m SO excited (I promise I really am a sympathetic spouse). Hi Lynn! I am so glad you and your husband loved this dish, but am so sorry it gave him acid reflux! I hope you absolutely love the left overs! Delicious! Particularly the sauce – will definitely use it again. Many thanks. PS – would also like to say how much I enjoy reading your blog, so thanks for that too! Thank you so much Helen! I am so glad you loved this recipe and you’re loving my blog! This was fantastic! I just made it tonight and will absolutely be making it again! I roasted the potatoes ahead of time, which helped it all come together quickly. Thank you for a great recipe!! Thank you! I am so glad you loved this recipe, Andrea! This looks so amazing, can’t wait to make this for Thanksgiving! Could I make this a week ahead of time and freeze it? This sounds phenomenal! Do you think it would work if I swapped the sweet potato for butternut squash? Hi Hannah! I am so glad you and your roommate loved this recipe! Thank you so much! Absolutely yummy! We made it tonight and it turned out. Thanks for the recipe! I made this for an Italian guy I’m dating, and Italians seem to be particularly opinionated about their food (and he’s no exception) so I was a bit intimidated, but he loved it! He’d never had gnocchi with sweet potatoes before but was a big fan. We mixed up the sauce and used sauteed mushrooms, blue cheese and toasted sunflower seeds instead – also delicious! That is so amazing! I am so glad you both loved this and it turned out wonderful for your dinner with him, Kate! Thank you! 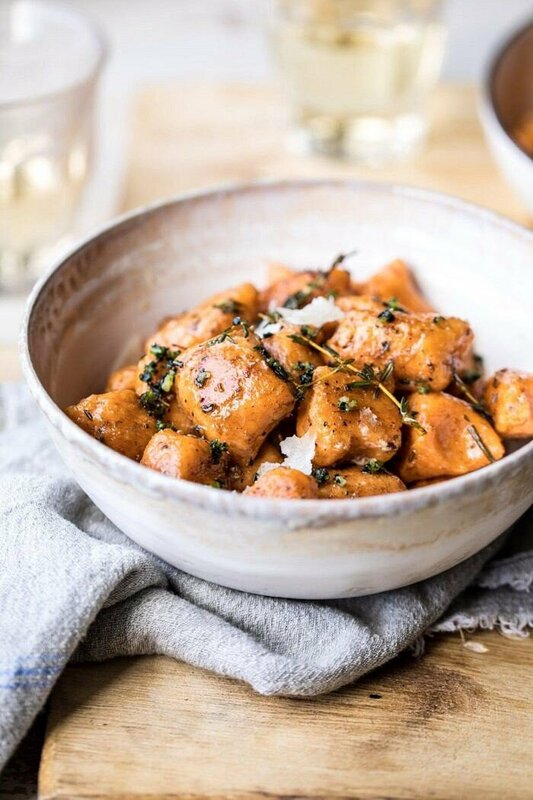 This SWEET POTATO GNOCCHI is WONDERFUL! Easy, delicious, impressive, its a real keeper! Wondering if I can freeze them and cook later? Hi! I wanted to make this for meal prep lunches. I’m also feeding two other people. If I need to double the recipe, do I double everything or just a few of the ingredients? Also, can I cook all the gnocchi at once then store it in the fridge or should i have it prepped and only cook the night before? Thanks! I’m not too familiar with sweet potatoes and have only ever mashed them in the past. I’m now living in Spain where the fresh produce is abundant. Having bought “a ton” of vegetables for what seemed like nothing compared to the UK I searched for what to do with the 3 large sweet potatoes I’d brought home. This recipe sounded delicious. I increased the quantities and not having any ricotta to hand made a homemade cheat ricotta from Jamie Oliver. My family were coming for supper having been snowboarding in the Sierra Nevadas. These gnocchi, aubergine parmigiana and homemade sourdough bread made for a tasty and fulfilling meal. Children and adults alike loved it. It’s super easy to make ans it’s now firmly established in my repertoire. Hi Helen! I am so glad you loved this recipe and it turned out amazing for you! Thank you so much! This was my first time making gnocchi and it was easier than I realized. I enoyed the sauces and consistency but I wish the gnocchi itself had a bit more flavor. I’m not sure what to do about that. It also made ALOT and I don’t think tasted as good reheated for lunch the next day. I’ll have to play around with this one for the next time. Thanks for the recipe!